This morning, the Hurricane Irene forecast from the National Hurricane Center has deteriorated for New York and New Jersey interests. Irene is currently forecast to pass right along the NJ coast and across the eastern boroughs of New York City as a strong Category 1 Hurricane on Sunday August 28th. As before, the forecast at three days lead time is still highly uncertain. 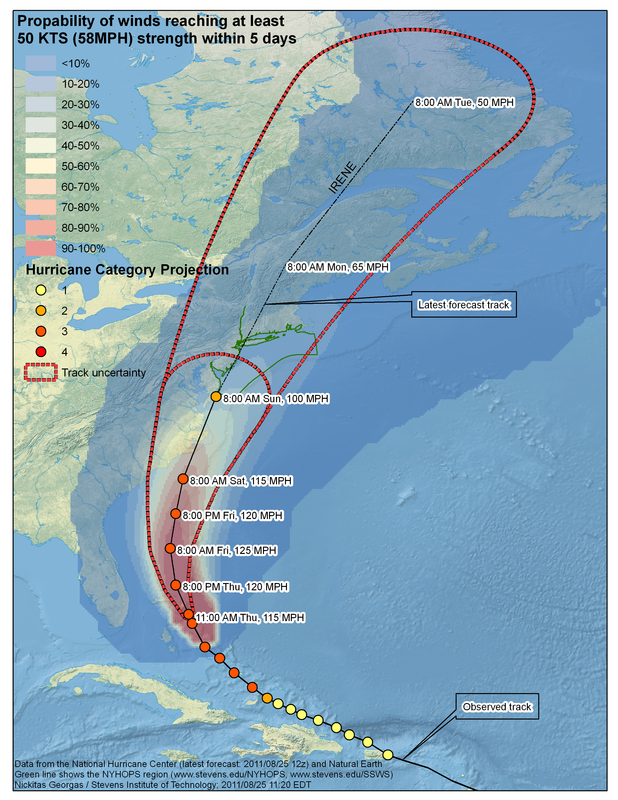 NHC forecast track for Hurricane Irene, including probabilities of Tropical Storm force winds. Our NYHOPS/SSWS domain is superimposed with a green border. Courtesy of Dr. Nickitas Georgas. The chances of NYC getting very dangerous 58+ mph steady winds are about 15% (see above), and the chances of having hurricane force (74+ mph) winds in NYC are still listed by NHC as being below 5%. However, the deadliest part of a hurricane is typically its storm surge, and even if the eye doesn’t hit NYC, we could see our worst storm surge in over 100 years. All of the models have now shifted the position of Hurricane Irene westward, with some tracks going inland in the mid-Atlantic states, many over New Jersey or near New York City, and a few over Long Island. The only silver lining is that the storm is expected to weaken due to interaction with land, but it is still likely to be hurricane strength at landfall. This is also a large storm, so impacts will be felt for hundreds of miles. The likely worst case scenario was spelled out in a recent post, comparing the storm to a hurricane that hit NYC in 1821. Stevens Institute two-day advance forecasts of storm surge, as well as waves and currents for NYC, NJ, Long Island waterways, are posted at about 1:30 AM daily, so look for them Saturday morning to give highly detailed forecasts for Irene’s impacts. In the meantime: Later today, NOAA’s storm surge model (SLOSH) will begin providing useful information for our area, with probabilities of various water levels. However, at this point, their model only projects out to Sunday morning so it highly misleading in its probabilities. The timing of the passage of Irene, during a new moon (Aug 29) at perigee (Aug 30), means that the spring tide range on Sunday will be one of the highest of the year. Presently, the Hurricane is forecast to approach the southern NJ coast late Sunday morning, passing Atlantic City at about the time of Low Tide (1pm). The hurricane is forecast to move slowly up the coast, making landfall along the South Shore of Long Island at about the time of High Tide (8pm). This timing is significant in that the incoming tide will increase the potential storm surge from south to north along the coastline of the NY Bight. 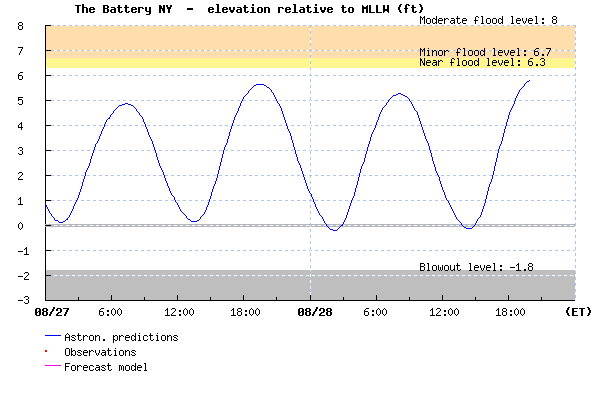 Predicted Tide (NOT including storm surge) at The Battery, New York City, for Saturday and Sunday August 27-28. High tides along the Jersey Shore are about one hour earlier. Due to the more westward forecast track, the predicted ocean wave heights have decreased slightly to 6.5 – 7.5 m (21 – 25 ft) on the shelf waters but will still generate extreme breaking waves and significant beach erosion (NOAA’s WavewatchIII). Waves can also cause higher water levels at area beaches, due to wave run-up and wave set-up, and this isn’t typically included in storm surge forecast models. Tom Herrington and Nickitas Georgas also contributed to this post.